Okay, I could never be *completely* wordless. It’s against my nature. Here is a not so recent photo of Baby Bee to keep you entertained through the weekend. 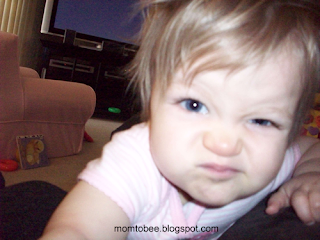 Baby Bee is making this face because _______________. PS: Why do babies always sleep in on the weekends when your husband is around to help, but never on the mornings when you have to taken care of them solo?! PPS: I get to go to a wedding this evening as a…wait for it…GUEST! Scathing judgmental reviews to come.